Staying in Maurice's Easy Corner Cottages. Chasing goats into the shed with the groundkeeper, and racing our collection of “soldier crabs”. But, the best memory was fishing with a local named Rudolph who taught me (as a young Illinoisan) how to walk safely on the volcanic rock at Captain’s Bay so that he could take me fishing at his favorite spot. After busting up a fresh pair of flip-flops, and spending a fun few hours with him, I did indeed catch an “Ol' Wife” Queen Triggerfish. His helpfulness did not stop there. As an aspiring chef, he recommended we take the fish to Lucy’s Restaurant to have Lucy clean and cook us all up a proper Anguillan feast. Wow!... was that meal great fun, with some of the loveliest folks we’ve ever met. Rudolph aspired to make it to “the States” and cook at the finest restaurants in New York City. I wished him well and still dream of the day he returns to Anguilla to open up his own first-class restaurant. Fast forward almost 20 years to 1998 when my wife and I honeymooned at Cap Juluca. My first trip back (and my wife Becky’s first trip overall) to Anguilla. Although Anguilla had changed in many ways, the friendliness and pride in Anguilla that the locals demonstrated ensured that Anguilla would figure into our future travel plans much more frequently. 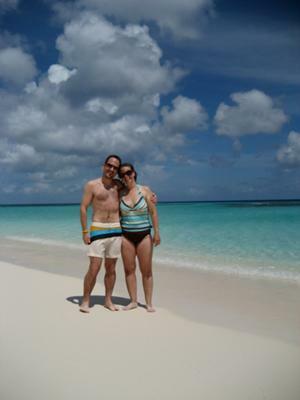 For our 10th Anniversary in 2008 we treated ourselves to a more D-I-Y trip to Anguilla. With Ku as our “home base” we were better able to experience daily baguette runs to Le Bon Pain, impromptu lunches at Hungry’s, and delicious and fun Friday nights “downtown” for BBQ and music. The beaches, the snorkeling, the sunsets with a Ti Punch, and the abundance of stars had not changed one iota over the passage of time. After that trip, we were able to convince my parents and sister to accompany us (now with our 2 children) back to Anguilla last year for a Family Vacation. We were able to secure a villa that accommodated us all, rented 2 cars, and shared all of our old experiences and created new ones. Now, my children (Samantha 8, and Nathaniel 5) can enjoy this paradise the same way that I have for almost 30 years! We all can’t wait to get back to Anguilla. Only 37 days away as I write this, with almost 2 feet of snow on the ground in suburban Chicago, while listening to the internet stream of KLASS FM 92.9 from Anguilla! Nori's Comments: Read Mom's charming story of the same trip (without the Honeymoon, ha ha). Sounds like a lovely family vacation spot.. Sounds like a wonderful family vacation, Hope you get to visit this great place again and make new family memories to share. I give them five stars for such a heartwarming story. Family is the most important part of our lives. It makes me wish I could have this experience with my family. Sounds like a wonderful place to visit! 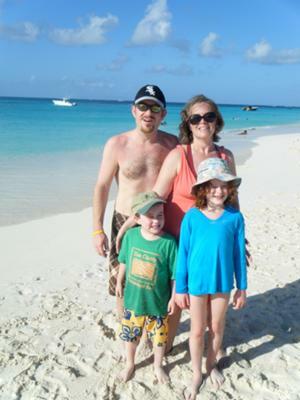 Eric and his family look so happy and having a great time in Anguilla! A very sweet story to. Sounds like an amazing place thanks for sharing your wonderful memories !! It is definitely a place I would love to visit with my family !! I love hearing about special places to go with family, where many memories can be made. Thanks for sharing!I'll keep this in mind for future vacation spots. What a lovely story and tradition to share with your family. Great memories and more to be made! Can't wait to get back to Anguilla to experience all the great things about. Wonderful story, Eric! What Vacation Dreams Are Made Of!!! parents and your wife and children and enjoy it so much you will be there again in the near future and I am sure more times in the years to come has to be a wonderful feeling. Makes me feel like I've been there. Amazing place, amazing people. Truly tranquility wrapped in blue. Makes me want to visit!!! Sounds like a wonderful place to visit with family as a couple any time of the year! Wow, you have described your memories so beautifully. 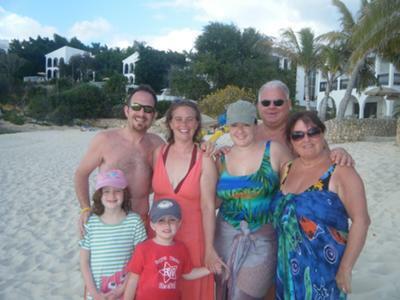 Here's to many more wonderful visits to Anguilla with your family! "Ol Wife" - what a hoot! THanks for sharing your story and photos. We are counting down the days as well when we will return. We are celebrating our fifth anniversary this Spring and would love for our family to join us someday! Thanks for the inspiration and keep on enjoying Anguilla! Click Your Heels 3 Times and BE THERE! Delicious reminiscing! How nice to pass on a lovely family tradition to their kids! We try different islands; guess Anguilla will be next! Your story shows that Anguilla is fun for all! The Anguillian Tourist Board should use your story and pictures. Everything you described was wonderful. And the pictures make me smile! I can feel the love you have for the place. You're lucky to have found your paradise! Your story was so great, and your family looks so happy. Not sure why anyone else entered the contest, hands down the best of the bunch. Anguilla looks beautiful and the people sound super cool, can't wait to see this year's pictures and hear more of your family's adventures. Have fun and good luck in the contest! Dude, are you kidding me, the best story (and pictures) by far. If you don't win, it's ridiculous. Chi-town voters...come out to support Eric! Eric's account of his Anguilla vacations makes me want to visit, too. If i'm lucky, maybe I will, someday. Thanks, Eric, for intoducing me to your favorite island. A vote for "Rudolph and the Ol' Wife" as the best as Eric's is obviously "from the heart." Not a generic excerpt, this is his personal story in Anguilla. No doubt, the best of the bunch for someone who is a true "family man." Enjoy your trip. Far and away the best story in the bunch. 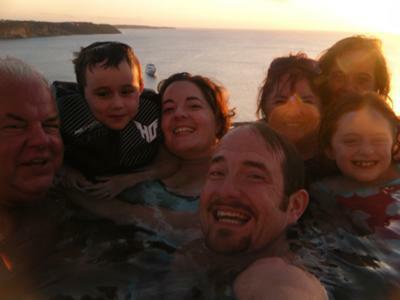 The tipping point is definitely the pictures....the best looking family on the nicest beaches in the world....awesome! Can't make it to Anguilla but thanks for the heads up on the great radio station. Almost feels like I am there. A great story about a great island; we, too, have stayed on Anguilla the first time at Cap Julaca and next week at GEMS Villa. Thanks for the story and the pictures. Loved the story! We are going to Anguilla next week and this made me even more excited about our trip. We went to Angullla over 15 years ago and I also was struck by the warmth and hospitality of the people. I wish Eric & his family a glorious trip. The best part of the story is the pics. Everyone looks so happy. A lifetime of wonderful memories! I'd love to go there sometime! A vacation destination for a lifetime! I bet that Ol'Wife was the best tasting fish ever! Great story! Your story and pictures make me smile. Anguilla obviously makes everyone happy. Leaving for Anguilla in a couple of weeks, staying at Ku on the most beautiful beach in the world. Thanks for writing the story. Can't wait to be there! Your family is very lucky to have such wonderful memories in such a beautiful place. What a catchy title. Made me want to find out what the story was all about. Great memories! Great memories--and plans to make more! What I love about this story is the multi-generational aspect. Also, bringing you children back to a memorable vacation spot of your own youth is a testament to how great Anguilla is. Can't wait for my trip next month. Makes me want to visit Anguilla. Leaving next week, and this story gets me psyched! My whole family is going, so this hits home. Thanks Eric! Everything sounds great. I wish I was there right now! I blew out a flip-flop on those rocks too! What joyful, happy-sounding trips; and, look at the happiness on their faces...I want to go to Anguilla and have that much fun!